The glimmer of gold will give your lifeless letters and packages an executive look. An eye-catching texture and luminous color create a professional finishing touch for outgoing mail that will definitely get noticed. It's a simple solution to a tedious and often time-consuming task. Instead of writing out your name and address by hand every time, all you have to do is stick these self-adhesive labels in place. Classiness and convenience make this choice as good as gold! 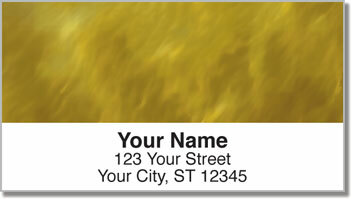 Order your very own Golden Light Wave Address Labels from CheckAdvantage today! Several other color options are also available. Plus, you can order matching personal checks too.